Home » How Will You Benefit from Creating Buyer Personas? Creating buyer personas is the first and most important step you should take when marketing your company. It lays the foundation for your target audience, content and distribution. Through buyer personas, your company will be able to create online content that not only creates a path for your visitors and customers, but for you as well. A buyer persona is a semi-fictional characterization of your target audience. The objective is to know everything about your buyer persona; their role in their job and life, their likes and dislikes, their demographic and more. This way you will better target your buyer persona. Have as many different buyer personas as target markets. So, how will you benefit from creating buyer personas? There’s not just one reason. Buyer personas help your company market itself in a number of ways. First, your buyer personas tell you which part of the buyer’s journey they are in. This way you can micro-target each persona in each stage of the buyer’s journey. If you are looking to attract more visitors to your website, you could write a blog aligned with what those buyer personas might be searching. Once you’ve attracted customers, you can start creating content that they like and build more leads. It is vital to know who you are selling to. Another benefit of using buyer personas is being able to connect with your potential customers. According to Schaefer Marketing Solutions, using the right messaging and media can target each buyer persona and speak directly to them. It then becomes easier to gain the trust of your potential customers. You’ll be able to communicate with them in the way that they understand best. Once you prove you are working for them, the trust will come. So, how else will you benefit from creating buyer personas? Buyer personas help align the workings of marketing and sales. If you are marketing the right content to the right people and the right time, it gives sales better access to understanding their potential leads’ wants. Sales will have better connection and rapport with their leads. Not only do buyer personas help with marketing, it helps with sales to close leads more easily. You will create stronger leads and save time doing it. Old sales tactics are not so useful now because of all the content on the Internet. Instead of cold-calling, finding buyer personas is more useful. Research your potential lead and connect with them on a human to human basis. 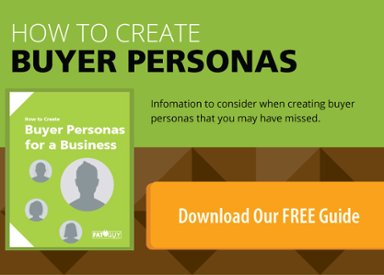 You and your company will benefit from creating buyer personas. Knowing who you are reaching will help solve everything else. For more information regarding marketing with buyer personas contact us at 516-535-5353 or email us at sales@fatguymedia.com.